Nellie Melba and Percy Grainger performed together only twice, both times in the context of fund-raising for the WWI War Effort in America. Both Grainger and Melba were deeply committed to using their talents for this cause. 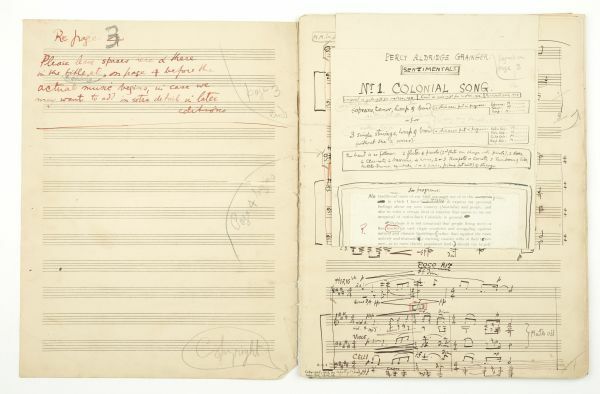 Exploring this relationship, Curator Heather Gaunt found another Australian fund-raising connection with Melba singing Grainger’s Colonial Song. “If the democratizing of the world is to be the great fundamental achievement of the war one of the most significant by-products is going to be the democratizing of art. Red Cross concerts and the atmosphere they engender have had much to do with promoting this development, and it was a Red Cross concert in Melbourne the other evening that brought forth another illustration of how whole-heartedly the great Australian queen of song, Nellie Melba, has entered into the democratic spirit of art. - Dr Heather Gaunt, Grainger Museum curator.